DIANNE is a modular software framework for designing, training and evaluating artificial neural networks. It is built on top of OSGi and AIOLOS and can transparently deploy and redeploy (parts of) a neural network on multiple machines, as well as scale up training on a compute cluster. DIANNE is available open source under the AGPL v3 license. In DIANNE neural networks are built as a directed graph. DIANNE comes with a web-based UI builder to drag-and-drop neural network modules and link them together. Most popular neural network building blocks like Linear, Convolution, Maxpool, Sigmoid, ReLU, etc. are supported out of the box. DIANNE provides various inputs for your neural network. It supports various popular image datasets such as ImageNet, MNIST, CIFAR-10/100, etc., and you can easily add your own. Besides input from datasets, you can also configure other data sources such as your webcam to forward input directly to your neural network. The underlying AIOLOS framework enables to deploy each individual module on any compute device connected that is running the DIANNE runtime. This gives you fine grained control on which module to execute on which device, allowing to stretch your neural network across the compute capabilities of multiple (embedded) devices. DIANNE provides a number of well-known optimization routines for training your neural network, ranging from vanilla SGD to Adam. 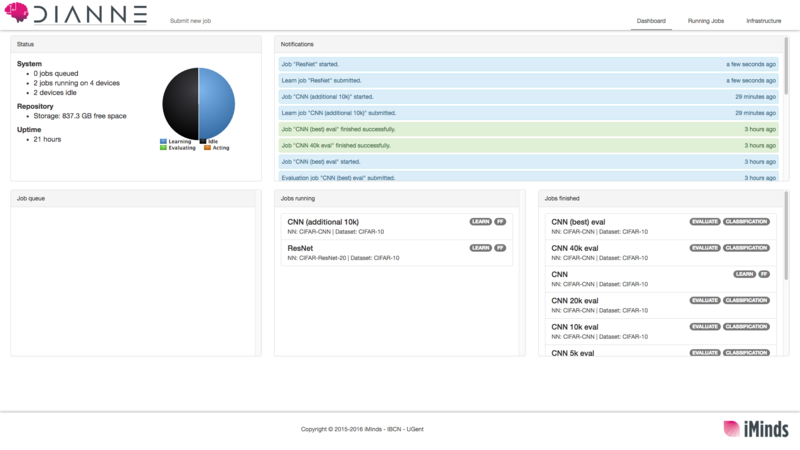 You can scale up your training using the DIANNE dashboard UI, which allows you to submit and track jobs on a compute cluster. You can also define custom routines for these jobs. Thanks to the distributed nature of DIANNE, it is possible to set up distributed training configurations, exploiting model parallelism or data parallelism. DIANNE is a research project running at Ghent University - imec. If you use DIANNE in your research, please cite one of those papers. Tim Verbelen received his PhD in 2013 on mobile cloud computing which resulted in the AIOLOS platform. Since 2014, he is working at iMinds IoT lab on distributed intelligence for supporting the next generation IoT applications. He is developing and maintaining most of the DIANNE platform code. Steven Bohez is working on a Ph.D. at Ghent University - iMinds and is focussing on advanced mobile cloud applications that are distributed between mobile devices and the cloud. He is using DIANNE to deploy neural networks on mobile robots that are trained in the cloud using distributed deep reinforcement learning. Elias De Coninck is working on a Ph.D. at Ghent University - iMinds on hybrid cloud systems. He is using DIANNE to research how to distill a minimal neural network to run on local infrastructure from a big teacher neural network deployed in the cloud.